EverywhereChair.com is your online source for portable, folding chairs and outdoor accessories. Their product line includes kids chairs, director's chairs, deck and yard chairs, backpack chairs, beach chairs, camping chairs, heavy duty chairs, portable stools, picnic accessories, folding rocking chairs, and much, much more. EverywhereChair.com is a growing family business, and while they are excited about their growth, they still hold onto their small family business service ethic and atmosphere. Save on these fantastic chairs from EverywhereChair.com with Everywhere Chair discounts, Everywhere Chair deals, Everywhere Chair promotions and Everywhere Chair coupons found on 58Coupons.com. Enjoy Free Shipping at Everywhere Chair when you spend $149 or more. Click to get code. When you spend $149+ at Everywhere Chair you can save $25 with this coupon code. Click link to enjoy this deal today. 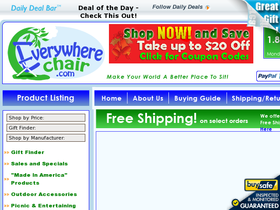 Right now you can save $15 on your order of $99 or more at EverywhereChair with this promo code. Click link to shop. EverywhereChair.com is offering you Free Shipping on Select Items. Click to view. Save $5 off your order of $49 or more at Everywhere Chair with this limited time code. Click link. Save $5 off your first order at Everywhere Chair when you sign up for their emails. Click link.